The news that nonfarm payrolls shrunk again last month by 263,000 is bad news, but a little perspective may help minimize the pain. But first, let’s recognize that there’s just no way to sugarcoat the fact that the economy has been losing jobs each and every month since January 2008. The question is whether the upward tick in job losses last month vs. August is a turn for the worse or just statistical noise on the way toward zero and, at some point, an expansion in the labor market? We don’t have a definitive answer, of course, but it’s worth pointing out that the reversal in the recovery trend also occurred in the June jobs update, and on a grander scale. But that was temporary and it soon gave way to more progress, albeit in relative terms by way of fewer losses. It’s also worth reminding that the reversal in June didn’t stop investors from bidding up asset prices in the ensuing months. This time, however, we may not be so lucky. What’s different? For one thing, September closed with strong rallies in virtually everything, as we discussed briefly yesterday. All the major asset classes have delivered powerful rallies since March. The problem is that the economic news accompanying the change in investor sentiment hasn’t been anywhere as stellar or consistent as the reflation in asset prices implied. The stage, it seems, has been set for a correction of sorts, some of which unfolded in yesterday’s bout of selling in the U.S. stock market, which suffered it’s worst one-day retreat in months. The larger issue is related to whether the nascent signs of economic recovery that we’ve been discussing these past several months have any internal momentum sans the government stimulus efforts of late. Such questions have been overlooked in the summer during the rush to jump on board the recovery bandwagon. But autumn has a way of refocusing summer flings through a more sober analytical prism. Regular readers of these digital pages will recall that we’ve been predicting the “technical end” of the recession for some time, probably in the second half of this year. One reason for thinking so is that our proprietary index of leading indicators published and analyzed regularly in The Beta Investment Report continue to lean in favor of recovery. But we’ve also been warning all along that there’s likely to be a longer-than-usual lag between the recession’s closure and the ensuing labor market’s recovery. In fact, that opens the debate on whether a recession can really be over if the labor market isn’t growing, but we’ll leave that for another day. Meantime, it’s clear that the minting of new jobs is usually among the last of the major economic metrics to rebound after a recession. Given the depth of the Great Recession, the labor market’s recovery will be that much slower and sluggish this time. For some perspective, let’s take a tour down memory lane. After the end of the vicious 1973-75 recession, the first month of gain in nonfarm payrolls came just two month’s after the contraction’s end. In the 1981-82 recession, nonfarm payrolls also posted a rise two months after the downturn’s formal demise in November 1982, as per NBER. And in the wake of the milder 2001 recession, job growth returned three months after the recession’s end. Where does that leave us in the mess du jour? Let’s be optimistic and say that the recession ended in September. 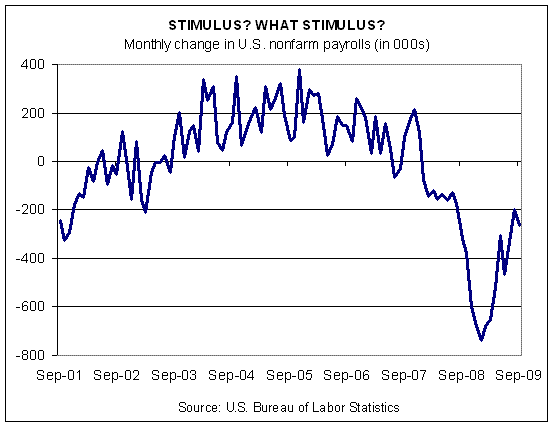 The standards of recent downturns imply that we might see a gain in nonfarm payrolls before this year’s out. But we must be cautious here for at least two reasons. One, it’s not yet obvious that the recession’s over. (If you’re waiting for NBER to speak, don’t hold your breath—the institution usually declares an end to recessions long after it’s already obvious.) Two, the downturn this time around was/is extraordinarily steep and so we shouldn’t expect that payrolls will rebound as quickly as they did in the past. All of which leads back to the advice we’ve been dispensing for months: The recovery ahead, when it does arrive, will be meek and prone to setbacks courtesy of a frail labor market, a negative aura that’s sure to reverberate throughout the consumer-dependent economy in the U.S. for some time. That’s been a risk factor all along. The difference now is that maybe, just maybe, the crowd understands the challenge ahead.